An Increased Focus on Women, Peace and Security: Will Women’s Organizations Get Their Due? The women, peace and security agenda received a lot of political attention over the past few weeks. On March 8th, International Women’s Day, the House of Commons Standing Committee on Foreign Affairs and International Development (FAAE) commenced a study on women, peace and security. The very next day, the Senate Liberals held an open caucus to discuss the same topic. The WPSN-C was present for all of these meetings, both as spectators and as witnesses. The first FAAE meeting had representatives from Global Affairs Canada testifying to their role in the implementation of the women, peace and security agenda. Here we learned of the policy and programming work and diplomatic efforts that have been undertaken by the department to implement this agenda. 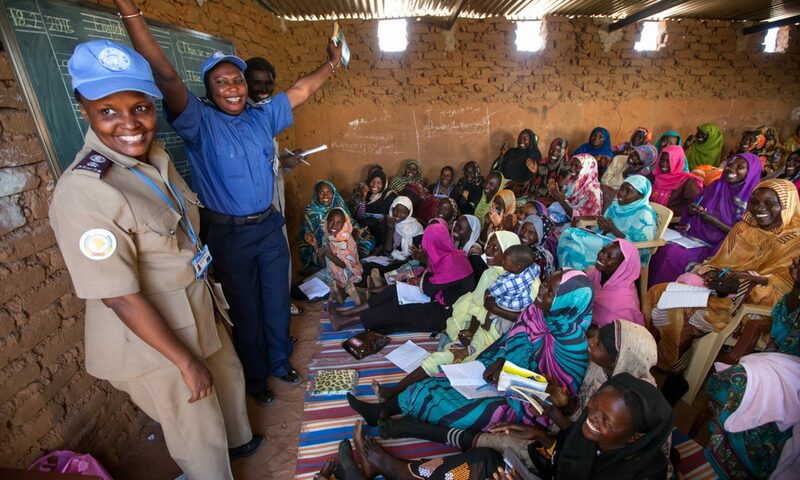 Global Affairs Canada staff pointed to successes, such as deploying a police force to the UN and other peace operations with 25% female officers (This surpasses the UN target of a police force consisting of 20% female officers.) They argued that Canada has held and continues to have a leadership role in aspects of the women, peace and security agenda. For example, Canada initiated and continues to chair the Group of Friends of Women, Peace and Security in New York. These efforts should be recognized and celebrated. While Global Affairs Canada can and should point to instances of success, there remained questions around the overall implementation of the women, peace and security agenda. As NDP MP Hélène Laverdière noted, there was an emphasis on protecting women from sexual violence and discrimination. The stubborn and unproductive narrative of women as victims appears to drive much of the programming and policy work of Global Affairs Canada. When questions arose regarding the participation of women and local grassroots organizations, Global Affairs Canada alluded to the difficulty of identifying and funding these groups. However, little insight was provided as to how to overcome these perceived difficulties. Indeed, it is appears easier to fund large organizations to provide women and girls contraception than to fund local organizations fighting for transformational change. The importance of supporting grassroots organizations was highlighted in the testimony of civil society organizations in both the Senate Liberals open caucus and the second FAAE meeting. These organizations presented a united front and a consistent message across committees – if long-term peace is the goal, fund women’s grassroots organizations. Every single civil society organization representative recommended this specific action and also called for the Canadian government to follow the UN’s recommendations of allocating a minimum of 15% of all funding related to peace and security programming to programs whose principle objective is gender equality and women’s empowerment. Another important development during the International Women’s week was the March 8th joint statement made by Honourable Stéphane Dion, Minister of Foreign Affairs, the Honourable Chrystia Freeland, Minister of International Trade, and the Honourable Marie-Claude Bibeau, Minister of International Development and La Francophonie. Here the Ministers announced the renewal of Canada’s Action Plan on Women, Peace and Security (C-NAP) – a document that is expiring as of March 31st, 2016. As WPSN-C reports (Worth the Wait? in 2014 and 2015’s Looking Back, Looking Forward) have highlighted, although the C-NAP’s existence is warmly welcomed, the current plan has many shortcomings. The inability for the document to be interpreted and implemented as a priority; the lack of an overarching vision or goal, specific targets and outcomes; and insufficient resources, including the absence of a high level champion for the file, are some of the barriers Canada faces to implementing the women, peace and security agenda. The renewal of the C-NAP is a big opportunity for Canada to make real progress on the women, peace and security agenda. Representatives at both the bureaucratic and political level separately indicated their desires to start fresh, with a renewed sense of purpose. Further, the Parliamentary Secretary to the Minister of Foreign Affairs, Pamela Goldsmith-Jones, has met with Swedish government representatives to learn about the implementation of Sweden’s iteration of a ‘feminist’ foreign policy. We have the chance to take what was learned from the first attempt at the C-NAP, leverage Canada’s wish to be a leader on gender equality, and incorporate global best practices to create a robust and transformative policy. Civil society pushing for the women, peace and security agenda face other timely opportunities. The government, under the leadership of Justin Trudeau, is publicly promoting itself globally as a defender and promoter of women’s rights and gender equality. Canada is attempting to position itself as a global leader in terms of these issues. This discourse can be used to amplify the women, peace and security agenda. We can also attempt to keep government officials accountable to the image they publically convey. Meeting the 15% funding target as outlined before, for instance, would be an indication of the level of action Canada is willing to take to become the leader it purports to be. It is these concrete decisions and actions that will solidify Canada’s leadership on gender equality and women’s rights. This political spotlight on the women, peace and security agenda is long overdue and greatly important. Opportunities abound, but so does the potential for disappointment. In the past, Canadian rhetoric has been positive surrounding women, peace and security, yet political and bureaucratic action has been lackluster. Will this time be different? Previous PostPrevious Canada’s National Action Plan on Women, Peace and Security: How Far Have We Come, and Where are We Going?